Born into an aristocratic family and educated at Eton and Cambridge, Cornwallis joined the army in 1757, seeing action in the Seven Years' War. Upon his father's death in 1762 he became Earl Cornwallis and entered the House of Lords. From 1766 until 1805 he was Colonel of the 33rd Regiment of Foot. He next saw military action in 1776 in the American War of Independence. Active in the advance forces of many campaigns, in 1780 he inflicted an embarrassing defeat on the American army at the Battle of Camden. He also commanded British forces in the March 1781 Pyrrhic victory at Guilford Court House. Cornwallis surrendered his army at Yorktown in October 1781 after an extended campaign through the Southern states, marked by disagreements between him and his superior, General Sir Henry Clinton. Cornwallis was educated at Eton College and Clare College, Cambridge. While at Eton, he received an injury to his eye by an accidental blow while playing hockey, from Shute Barrington, later Bishop of Durham. He obtained his first commission as Ensign in the 1st Foot Guards, on 8 December 1757. He then sought and gained permission to engage in military studies abroad. After travelling on the continent with a Prussian officer, Captain de Roguin, he studied at the military academy of Turin. Upon completion of his studies in Turin in 1758, he traveled to Geneva, where he learned that British troops were to be sent to the Continent in the Seven Years' War. Although he tried to reach his regiment before it sailed from the Isle of Wight, he learnt upon reaching Cologne that it had already sailed. He managed instead to secure an appointment as a staff officer to Lord Granby. A year later, he participated at the Battle of Minden, a major battle that prevented a French invasion of Hanover. After the battle, he purchased a captaincy in the 85th Regiment of Foot. In 1761, he served with the 12th Foot and was promoted to Brevet Lieutenant-Colonel. He led his regiment in the Battle of Villinghausen on 15–16 July 1761, and was noted for his gallantry. In 1762 his regiment was involved in heavy fighting during the Battle of Wilhelmsthal. A few weeks later they defeated Saxon troops at the Battle of Lutterberg and ended the year by participating in the Siege of Cassel. In January 1760 Cornwallis became a Member of Parliament, entering the House of Commons for the village of Eye in Suffolk. He succeeded his father as 2nd Earl Cornwallis in 1762, which resulted in his elevation to the House of Lords. He became a protege of the leading Whig magnate, and future Prime Minister, Lord Rockingham. He was one of five peers who voted against the 1765 Stamp Act out of sympathy with the colonists. In the following years, he maintained a strong degree of support for the colonists during the tensions and crisis that led to the War of Independence. On 14 July 1768 he married Jemima Tullekin Jones, daughter of a regimental colonel. The union was, by all accounts, happy. They settled in Culford, Suffolk, where their children, Mary (28 June 1769 – 17 July 1840), and Charles were born. Jemima died on 14 April 1779. During the postwar years, Cornwallis had remained active in military matters. He became colonel of the 33rd Regiment of Foot in 1766. On 29 September 1775 he was promoted to major general. With the outbreak of the war in North America, Cornwallis put his previous misgivings aside and sought active service; proposing an expedition to the southern colonies. 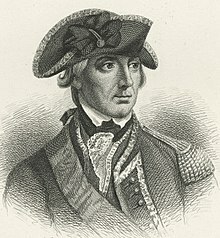 Promoted to lieutenant general in North America, he began his service in 1776 under General Sir Henry Clinton with the failed Siege of Charleston. He and Clinton then sailed for New York City, where they participated in General William Howe's campaign for New York City. Cornwallis was often given a leading role during this campaign; his division was in the lead at the Battle of Long Island, and he chased the retreating George Washington across New Jersey after the city fell. Howe recognized the successful close of the campaign "much to the honor of his lordship and the officers and soldiers under his command." General Howe granted Cornwallis leave in December 1776; however it was cancelled after Washington launched his surprise attack on Trenton on 26 December. Howe ordered Cornwallis to return to New Jersey to deal with Washington. Cornwallis gathered together garrisons scattered across New Jersey and moved them towards Trenton. On 2 January 1777, as he advanced on Trenton, his forces were engaged in extended skirmishing that delayed the army's arrival at Washington's position on the Assunpink Creek until late in the day. Cornwallis was unable to dislodge Washington in the battle that followed. Cornwallis prepared his troops to continue the assault of Washington's position the next day, but critically failed to send out adequate patrols to monitor the Americans. During the night, Washington's forces slipped around Cornwallis's and attacked the British outpost at Princeton. Washington's success was aided by a deception: he had men maintain blazing campfires and keep up sounds of camp activity during his movement. Cornwallis spent the winter in New York and New Jersey, where the forces under his command were engaged in ongoing skirmishes with the Americans. Cornwallis continued to serve under Howe on his campaign for control of the rebel capital, Philadelphia. Cornwallis was again often in an advance role, leading the flanking manoeuvre at the Battle of Brandywine, and playing key roles at Germantown and Fort Mercer. With the army in winter quarters in Philadelphia, Cornwallis finally returned home for leave. Upon his return in 1778, Howe had been replaced by Clinton as commander in chief, and Cornwallis was now second in command. The entry of France into the war prompted the British leaders to redeploy their armed forces for a more global war, and Philadelphia was abandoned. Cornwallis commanded the rearguard during the overland withdrawal to New York City and played an important role in the Battle of Monmouth on 28 June 1778. After a surprise attack on the British rearguard, Cornwallis launched a counter-attack which checked the enemy advance. Even though Clinton praised Cornwallis for his performance at Monmouth, he eventually came to blame him for failing to win the day. In November 1778, Cornwallis once more returned to England to be with his ailing wife Jemima, who died in February 1779. Cornwallis returned to America in July 1779, where he was to play a central role as the lead commander of the British "Southern strategy" (which was to invade the south on the assumption that a significantly more Loyalist population would rise up and assist in putting the rebellion down). At the end of 1779, Henry Clinton and Cornwallis transported a large force south and initiated the second siege of Charleston during the spring of 1780, which resulted in the surrender of the Continental forces under Benjamin Lincoln. After the siege of Charleston and the destruction of Abraham Buford's Virginia regiments at Waxhaw, Clinton returned to New York, leaving Cornwallis in command in the south. The relationship between Clinton and Cornwallis had noticeably soured during the Charleston campaign, and they were barely on speaking terms when Clinton left. The task Clinton left Cornwallis with was to, first and foremost, preserve the gains made by taking Charleston, and only then engage in offensive moves. 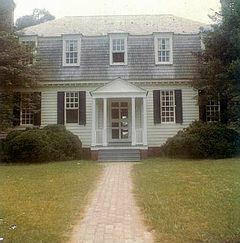 Clinton's orders gave Cornwallis wide latitude in how to achieve the goal of pacifying both South and North Carolina, after which Clinton expected Cornwallis to move into Virginia. Clinton wrote, "I should wish you to assist in operations which will certainly be carried on in the Chesapeake as soon as we are relieve from our apprehension of a superior fleet and the season will admit ..." However, Clinton provided Cornwallis with a relatively modest force of British, German, and provincial (Loyalist) regiments—about 3,000 men—with which to accomplish all of this. The forces he was given to accomplish this were limited by the necessity of keeping a large British force in New York under Clinton to shadow Washington. Cornwallis was expected to recruit more Loyalists, who were believed to be more numerous in the southern colonies. Cornwallis established a series of outposts in South Carolina, but keeping communication and supply lines open was an ongoing challenge. Supplies not available locally (like uniforms, camp gear, arms, and ammunition) were delivered all too infrequently, supply ships were frequent targets of local privateers, and bad weather impeded the work. In order to help provide fresh food and forage for his troops, Cornwallis established two commissioners. 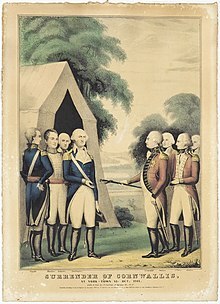 The first was responsible for administering goods confiscated from Patriots (he avoided confiscating supplies from Loyalists since he depended on them for manpower and intelligence), and the second for administering land that was confiscated. A chronic shortage of hard currency (another supply only infrequently delivered to Charleston) made it difficult to purchase supplies from any source, either Patriot or Loyalist. Cornwallis also attempted to reestablish civil authority under British or Loyalist oversight. Although these attempts met with limited success, they were continually undermined by Patriot activity, both political and military, and the indifferent abuses of British and Loyalist forces. Patriot militia companies constantly harassed Loyalists, small British units, and supply and communication lines. In August 1780 Cornwallis' forces met a larger but relatively untried army under the command of Horatio Gates at the Battle of Camden, where they inflicted heavy casualties and routed part of the force. This served to keep South Carolina clear of Continental forces, and was a blow to rebel morale. The victory added to his reputation, although the rout of the American rebels had as much to do with the failings of Gates (whose rapid departure from the battlefield was widely noted) as it did the skill of Cornwallis. In London, Cornwallis was perceived as a hero, and was viewed by many there as the right man to lead the British forces to victory over the rebels. As the opposition seemed to melt away, Cornwallis optimistically began to advance north into North Carolina while militia activity continued to harass the troops he left in South Carolina. Attempts by Cornwallis to rally Loyalist support were dealt significant blows when a large gathering of them was defeated at Kings Mountain, only a day's march from Cornwallis and his army, and another large detachment of his army was decisively defeated at Cowpens. He then clashed with the rebuilt Continental army under General Nathanael Greene at Guilford Court House in North Carolina, winning a Pyrrhic victory with a bayonet charge against a numerically superior enemy. In the battle, he controversially ordered grape shot to be fired into a mass of combat that resulted in friendly casualties but helped break the American line. Cornwallis then moved his forces to Wilmington on the coast to resupply. Cornwallis himself had generally been successful in his battles, but the constant marching and the losses incurred had shrunk and tired out his army. Greene, whose army was still intact after the loss at Guilford Courthouse, shadowed Cornwallis toward Wilmington, but then crossed into South Carolina, where over the course of several months American forces regained control over most of the state. Cornwallis received dispatches in Wilmington informing him that another British army under Generals William Phillips and Benedict Arnold had been sent to Virginia. Believing that North Carolina could not be subdued unless its supply lines from Virginia were cut, he decided to join forces with Phillips. On arrival in Virginia, Cornwallis took command of Phillips' army. Phillips, a personal friend of Cornwallis, died one week before Cornwallis reached his position at Petersburg. He then sought to fulfil orders Clinton had given to Phillips, and raided the Virginia countryside, destroying American military and economic targets. In March 1781, in response to the threat posed by Arnold and Phillips, General Washington had dispatched the Marquis de Lafayette to defend Virginia. The young Frenchman had 3,200 men at his command, but British troops under Cornwallis' command totalled 7,200. Lafayette skirmished with Cornwallis, avoiding a decisive battle while gathering reinforcements. It was during this period that Cornwallis and Clinton exchanged a series of letters in which Clinton issued a number of confusing, contradictory, and not entirely forceful orders. Cornwallis eventually received firm orders from Clinton to choose a position on the Virginia Peninsula—referred to in contemporary letters as the "Williamsburg Neck"—and construct a fortified naval post to shelter ships of the line. In complying with this order, Cornwallis put himself in a position to become trapped. With the arrival of the French fleet under the Comte de Grasse and General Washington's combined French-American army, Cornwallis found himself cut off. After the Royal Navy fleet under Admiral Thomas Graves was defeated by the French at the Battle of the Chesapeake, and the French siege train arrived from Newport, Rhode Island, his position became untenable. He surrendered after about three weeks' siege to General Washington and the French commander, the Comte de Rochambeau, on 19 October 1781. Cornwallis, apparently not wanting to face Washington, claimed to be ill on the day of the surrender, and sent Brigadier General Charles O'Hara in his place to surrender his sword formally. Washington had his second-in-command, Benjamin Lincoln, accept Cornwallis' sword. Cornwallis returned to Britain with Benedict Arnold, and they were cheered when they landed in Britain on 21 January 1782. His surrender did not mark the end of the war, though it ended major fighting in the American theatre. Because he was released on parole, Cornwallis refused to serve again until the war came to an end in 1783. An attempt failed to exchange him for Henry Laurens, an American diplomat who was released from the Tower of London in anticipation that Cornwallis would be freed from his parole. His tactics in America, especially during the southern campaign, were a frequent subject of criticism by his political enemies in London, principally General Clinton, who tried to blame him for the failures of the southern campaign. This led to an exchange of pamphlets between the two men in which Cornwallis had much the better of the argument. Cornwallis also retained the confidence of King George III and the government of the earl of Shelburne, but he was placed in a financially precarious state by his inability to be on active duty. In August 1785 he was sent to Prussia as an ambassador to the court of Frederick the Great to sound out a possible alliance. He attended manoeuvres along with the Duke of York where they encountered his old opponent Lafayette. In 1786 Cornwallis was made a Knight Companion of the Most Noble Order of the Garter. The same year he accepted appointment as Governor-General and commander in chief in India. He had in 1782 been offered the governor-generalship only, but refused the post until he also received military command as well. Cornwallis engaged in reforms of all types, that affected many areas of civil, military, and corporate administration. According to historian Jerry Dupont, Cornwallis was responsible for "laying the foundation for British rule throughout India and setting standards for the services, courts and revenue collection that remained remarkably unaltered almost to the end of the British era." He also enacted important reforms in the operations of the British East India Company and, with the notable exception of the Kingdom of Mysore, managed to keep the company out of military conflicts during his tenure. Prior to Cornwallis's tenure, company employees were allowed to trade on their own accounts and use company ships to send their own goods back to Europe. This practice was tolerated when the company was profitable, but by the 1780s the company's finances were not in good shape. Cornwallis eliminated the practice, increasing employee salaries in compensation. He also worked to reduce nepotism and political favouritism, instituting the practice of merit-based advancement. Criminal and civil justice systems in the company's territories were a confusing overlay of legal systems, jurisdictions, and methods of administration. Cornwallis had the company take over the few remaining judicial powers of the Nawab of Bengal, the titular local ruler of much of the Bengal Presidency, and gave some judicial powers to company employees. In 1790 he introduced circuit courts with company employees as judges, and set up a court of appeals in Calcutta. He had the legal frameworks of Muslim and Hindu law translated into English, and promulgated administrative regulations and a new civil and criminal code. This work, introduced in 1793, was known as the Cornwallis Code. One consequence of the code was that it instituted a type of racism, placing the British as an elite class on top of the complex status hierarchy of caste and religion that existed in India at the time. Cornwallis held racist views, in a manner common at the time; of mixed European-Indians he wrote, "...as on account of their colour & extraction they are considered in this country as inferior to Europeans, I am of opinion that those of them who possess the best abilities could not command that authority and respect which is necessary in the due discharge of the duty of an officer." Cornwallis's attitude toward the lower classes did, however, include a benevolent and somewhat paternalistic desire to improve their condition. He introduced legislation to protect native weavers who were sometimes forced into working at starvation wages by unscrupulous company employees, outlawed child slavery, and established in 1791 a Sanskrit college for Hindus that is now the Government Sanskrit College in Benares. He also established a mint in Calcutta that, in addition to benefiting the poor by providing a reliable standard currency, was a forerunner of India's modern currency. Cornwallis had been sent to India with instructions to avoid conflict with the company's neighbors. Early in his tenure he abrogated agreements with the Maratha Empire and the Nizam of Hyderabad that he saw as violating the 1784 Treaty of Mangalore that ended the Second Anglo-Mysore War. This ensured the company's non-involvement in the Maratha-Mysore War (1785–1787). He was, however, manouevred into the establishment of a new company based at Penang (in present-day Malaysia), where conflict was avoided when he agreed to pay a stipend to the local rajah for use of the base. Fort Cornwallis in Penang is named for Cornwallis. The King of Nepal appealed to Cornwallis in 1792 for military assistance. Cornwallis declined the king's request, sending instead Colonel William Kirkpatrick to mediate the dispute. Kirkpatrick was the first Englishman to see Nepal; by the time he reached Kathmandu in 1793, the parties had already resolved their dispute. The company was unavoidably drawn into war with Mysore in 1790. 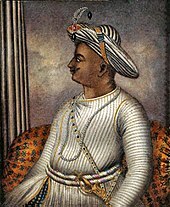 Tipu Sultan, Mysore's ruler, had expressed contempt for the British not long after signing the 1784 Treaty of Mangalore, and also expressed a desire to renew conflict with them. In late 1789 he invaded the Kingdom of Travancore, a company ally according to that treaty, because of territorial disputes and Travancore's harbouring of refugees from other Mysorean actions. Cornwallis ordered company and Crown troops to mobilize in response. The 1790 campaign against Tipu was conducted by General William Medows, and it was a limited success. Medows successfully occupied the Coimbatore district, but Tipu counterattacked and was able to reduce the British position to a small number of strongly held outposts. Tipu then invaded the Carnatic, where he attempted unsuccessfully to draw the French into the conflict. Because of Medows' weak campaigning, Cornwallis personally took command of the British forces in 1791. When the war broke out, Cornwallis negotiated alliances with the Marathas and Hyderabad. Cornwallis ascended the Eastern Ghats to reach the Deccan Plateau in February 1791. After successfully besieging Bangalore, Cornwallis then joined forces with Hyderabadi forces that he described as "extremely defective in almost every point of military discipline", and their presence in the army ultimately presented more difficulties than assistance. These forces then marched toward the Mysorean capital at Seringapatam, compelling Tipu to retreat into the city at the Battle of Arakere on 15 May. Dwindling provisions, exacerbated by Tipu's slash-and-burn tactics, forced Cornwallis to abandon the idea of besieging Seringapatam that season, so he retreated to Bangalore. In January 1792 the army, now well provisioned, set out for Seringapatam. Arriving before the city on 5 February, Cornwallis quickly eliminated Tipu's defensive positions outside the city, and then began siege operations. Tipu requested negotiations on 23 February, and peace was agreed on 18 March. Cornwallis and his allies demanded the cession of half of Mysorean territory, much of which went to the allies. As a guarantee of Tipu's performance, two of his sons were delivered to Cornwallis as hostages. 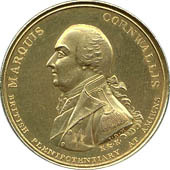 Cornwallis and other British commanders, in a move appreciated by their soldiers, donated prize money awarded them to be distributed among the rank and file. For his success in conducting the war, Cornwallis was created Marquess Cornwallis in 1792, although he did not learn of it until the following year. He returned to England the following year, and was succeeded by Sir John Shore. Upon his return to Britain in 1794, he found it militarily engaged in the French Revolutionary Wars. After he was sent on an ultimately fruitless diplomatic mission to stop the fighting, he was appointed master of the ordnance, a post he held until 1798. In this position he was responsible for much of the British Army's military infrastructure, overseeing its storage depots and supply infrastructure, as well as commanding its artillery and engineering forces. He oversaw improvements to Britain's coastal defences, and was able to expand Woolwich Academy's artillery training program to address a significant shortage of qualified artillery officers. His attempts to significantly reform the military were hampered by the ongoing war. In June 1798 he was appointed Lord Lieutenant of Ireland and Commander-in-Chief, Ireland. His appointment, which had been discussed as early as 1797, was made in response to the outbreak in late May of the Irish Rebellion of 1798. His appointment was greeted unfavourably by the Irish elite, who preferred his predecessor Lord Camden, and suspected he had liberal sympathies with the predominantly Catholic rebels. However, he struck up a good working relationship with Lord Castlereagh, whom he had appointed as Chief Secretary for Ireland. In his combined role as both Lord Lieutenant and Commander-in-Chief of the Royal Irish Army Cornwallis oversaw the defeat of both the Irish rebels and a French invasion force led by General Jean Humbert that landed in Connacht in August 1798. Panicked by the landing and the subsequent British defeat at the Battle of Castlebar, Pitt despatched thousands of reinforcements to Ireland, swelling British forces there to 60,000. The French invaders were defeated and forced to surrender at the Battle of Ballinamuck, after which Cornwallis ordered the execution by lot of a number of Irish rebels. During the autumn Cornwallis secured government control over most of the island, and organised the suppression of the remaining supporters of the United Irish movement. Cornwallis was also instrumental in securing passage in 1800 of the Act of Union by the Parliament of Ireland, a necessary step in the creation of the United Kingdom of Great Britain and Ireland. The process, which essentially required the buying of Parliamentary votes through patronage and the granting of peerages, was one that Cornwallis found quite distasteful: he wrote "My occupation is now of the most unpleasant nature, negotiating and jobbing with the most corrupt people under heaven. I despise and hate myself every hour for engaging in such dirty work, and am supported only by the reflection that without an Union the British Empire must be dissolved." Although Cornwallis recognised that the union with Ireland was unlikely to succeed without Catholic emancipation, he and William Pitt were unable to move King George on the subject. Pitt consequently resigned, and Cornwallis also resigned his offices, returning to London in May 1801. Expecting an opportunity to relax at home, Cornwallis was instead despatched not long after his return to take command of Eastern District with orders to lead the defences of eastern Britain against a threatened French invasion. Cornwallis was then sent to France to finalise peace terms with Bonaparte. The peace negotiations were made possible in Britain by financial pressure brought on by the ongoing wars and by Bonaparte's desire to consolidate his hold on the Continent. Pitt's resignation brought Henry Addington to power, and he appointed Cornwallis as plenipotentiary minister to France. The negotiations resulted in the Treaty of Amiens, which Cornwallis signed on behalf the United Kingdom on 25 March 1802. The treaty ended the War of the Second Coalition, but the peace was short-lived. Actions by Bonaparte over the next year alarmed the other European powers, and the United Kingdom refused to withdraw forces from Malta as specified in the treaty. By May 1803 war was again declared. Cornwallis is often seen as being partially responsible for conceding too much in the negotiations, although much had already been granted to France in the preliminary negotiations. In 1805 Cornwallis was reappointed Governor-General of India by Pitt (who had again become Prime Minister), this time to curb the expansionist activity of Lord Wellesley (older brother of Colonel Arthur Wellesley, later Duke of Wellington). He arrived in India in July 1805, and died on 5 October of a fever at Gauspur in Ghazipur, at that time in the Varanasi kingdom. Cornwallis was buried there, overlooking the Ganges River, where his memorial is a protected monument maintained by the Archaeological Survey of India. His son Charles became the 2nd Marquess. Having five daughters but no sons, the marquessate became extinct on his death, but he was succeeded in his remaining titles by his uncle, the brother of the general, the Right Reverend James Cornwallis. Cornwallis appears in the 1835 novel Horse-Shoe Robinson by John Pendleton Kennedy, a historical romance set against the background of the Southern campaigns in the American War of Independence, and interacts with the fictional characters in the book. He is depicted as courtly in manner, but tolerant, or even supportive, of brutal practices against those found deficient among his own forces, and against enemy prisoners. In the 2000 film The Patriot about the events leading up to Yorktown, Cornwallis was portrayed by English actor Tom Wilkinson. In Ireland his legacy also includes the Wicklow Military Road (now the R115) through the Wicklow Mountains. Fictional accounts of the rebellion, such as The Year of the French by Thomas Flanagan, feature Cornwallis. In India he is remembered for his victory against Tipu Sultan in the Mysore war and his promulgation of revenue and judicial acts. Fort Cornwallis, founded in 1786 in George Town, Prince of Wales Island (now the island part of the Malaysian state of Penang), is named for him. He is remembered for his deeds in England. A building is named after him at the University of Kent, as are boarding houses at The Royal Hospital School and Culford School in Suffolk. Statues of Cornwallis can be seen in St. Paul's Cathedral, London, Fort Museum, Fort St. George, Chennai, and in the Victoria Memorial, Kolkata. The public house "The Marquis of Cornwallis" in Layham, Suffolk, was named after him. Cornwallis was the recipient of the first British commemorative statue sent to the Indian subcontinent. 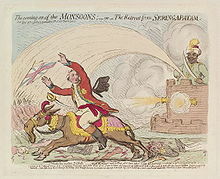 On his retirement in 1792, and in celebration of his victory over Tipu Sultan, the British residents of Madras (renamed Chennai in 1996) voted in May that year to commission a portrait in oils, and a statue, for their city. A request was sent, through Sir John Call, to the Council of the Royal Academy in London to hold a competition. Only one artist submitted a model, and that was Thomas Banks, RA. 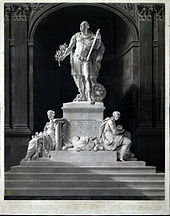 The statue was unveiled on the Parade Grounds of Fort St. George, Madras, on 15 May 1800, after being exhibited at the Royal Academy. The eight-foot tall marble with its pedestal base depicts the children of Tipu Sultan being handed over to Cornwallis as part of the treaty to end the war. Cornwallis wears the robes of a Garter Knight. . After Independence, the statue was moved to the Reading Room of the Connemara Library, Madras, before it was transferred to the entrance of the Fort Museum in 1948. The first British statue to be erected in Calcutta, the capital of British India, was also to Cornwallis. The marble portrait statue, with figures of Fortitude and Truth on each side of the plinth's base, was completed by John Bacon, Jr., and was a variant of the statue finished by John Bacon Sr. for East India House in London. In this work Cornwallis appears as a hero wearing a Roman kilt and carrying a sheathed short sword. A cornucopia symbolizing the abundance pouring into the coffers of the East India Company (EIC) is behind the left foot. A third statue, for Bombay, was commissioned from the studios of John Bacon Jr. Bacon was paid £5250 for the standing figure, which portrayed Cornwallis wearing an officer's tailcoat, breeches, brocade and an immense cloak. The statue was covered by a protective cupola on Elphinstone Circle, before it was damaged in August 1965 and removed to the grounds of the Bhau Daji Lad Museum, Byculla, Bombay. The last memorial erected to Cornwallis in British India was his mausoleum at Ghazipur, completed in 1824 and funded by a public subscription raised by the people of Bengal. Designed by Thomas Fraser, the free standing marble cenotaph, topped by a funerary urn, was created by John Flaxman, RA. It was commissioned by the Court of Directors of the East India Company at a General Meeting held in February 1822. Flaxman completed the work in March 1824 and it was shipped to India in April. Flaxman received £525 for his portrait medallion of Cornwallis, carved in relief for two of the four panels. The two others have a figure of a Hindu and Muslim, heads bowed in mourning (a typical motif for Flaxman). The reverse has a figure of a British soldier and an Indian sepoy, also in mourning. Adams, R (October 1931). 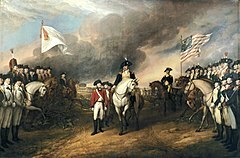 "A View of Cornwallis's Surrender at Yorktown". American Historical Review. 37 (1): 25–49. doi:10.2307/1842255.